Jack Butala: Seller Called Back on My Offer – Wants More Money. Every Single month we give away a property for free. It’s super simple to qualify. Two simple steps. Leave us your feedback for this podcast on iTunes and number two, get the free ebook at landacademy.com, you don’t even have to read it. Thanks for listening. Jack Butala here for LandAcademy. 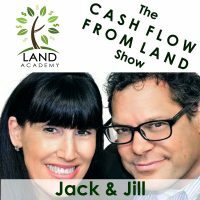 Welcome to our Cash Flow from Land Show, in this eight-part series Jill and I talk about what to do when sellers begin to call you back based on the letters and offers that you’ve mailed them. Jill, this is Episode two of eight and it’s called Seller Called Back on my Offer and They Want More Money. Great show today as always. Before we start, let’s take a call. But now, no, Alex this is a great question. Do you want to go first, or should I Jill? This is kind of more you, your thing. You’re a big planner and big picture person and stuff Steven so I’d like you to take it. You know, this isn’t a [inaudible 00:01:29] … Retirement and IRAs and things like that they’re out. They should be included in everyone’s, or just about everyone’s investment portfolio. So this is not a passive … If you’re looking at a passive investment vehicle, this is not it. This is a part-to-full-time business opportunity to earn some huge payouts of income but it’s, you know. You’re running a business. I’m not saying you’re working eighteen hours a day, I’m saying … I mean you can do it on many, many, many … Most of our members just do it on the weekend until they make enough money to quit their jobs. But to answer your question Alex. You should do both, but if you’re not interested in running a part-time gig this is not for you. That’s a little negative, isn’t it Jill? Yeah like where are you going with that? It’s not a passive investment vehicle. No, you know, it’s really good I mean, I guess, the point is here listen to your wife A) you never want to tick off your wife, come on [crosstalk 00:02:35] You don’t want to be married very long Alex. Yeah Alex, dump all that, do this and don’t tell her because you know it’s better. “And this money for whatever.” Done. That’s a much better, practical answer and approach to keeping your marriage intact than what I said. Exactly. Then everybody’s happy, and then, depending … In a perfect world you’ll make some changes as these things grow and whatever and it’s all good. So, thank you. Okay, so what was our … Today is the seller calls back and wants more money. I’m going to set it up, this is the second show of an eight-part series that Jill and I put together. Where we talk about what sellers say when they call you back. [inaudible 00:04:33] send a ton of letters out making offers on a lot of properties. This is what we teach to our members, and we’ve been talking about it for quite some time now on the air. Send a lot of offers out. The seller receives the offer, they pick up the phone, and they call you back and they have an assortment of responses. Jill and I, just for fun, have categorized them and this is vaguely number two of eight. They want more money. What do you do Jill? You just up your offer, and whatever it is. Just kidding. Okay so, I say, number one, yay I’m happy that they called back so that’s great. The first thing I want to find out is it worth it because you know what, it might be. So my first thing is, ask ’em why they think that and do your homework. Well let me give you some, let’s use like a raw example. We sent a bunch of offers out to all the twenty acre properties in Northern Oregon and we offered $4000 per twenty acre property that fit within our criteria. A bunch of people call back and one guy calls back and says, “That amount of money, you know, I understand your point. I looked you guys up on the internet, I know you’re legit. I want $8000 and you offered me-” What did I just say Jill? “You offered me four, I want eight”. Jill, go ahead. Well, Mr. Jones. Thank you, I appreciate you doing your homework and understanding who we are and what we do. Since you did that, you know that I’m a wholesaler. Let’s talk about this, why do you … You threw me under the bus here Steven, sorry. Oh, I’m sorry. I didn’t mean to do that at all. No, no it’s all good, it’s all good. I was just trying to make it less philosophical and more like, this really happens all the time and you’re a pro Jill. I mean, I didn’t mean to do that at all. I’m sorry. You check to see if it really is worth eight. Right, eight by my numbers. You know what I mean? There could be a reason that it is. Because when I’m sending out … When we, really you, are sending out these offers all over this. We’re not looking up the streets, we’re not looking up the details on this one. It’s in the county and met this criteria. I don’t have all that information yet, until they call me back. Now I’m really looking hard at it, it might be worth more. It might. It might be worth six. I might give em five. I might come up to eight. I don’t know, I gotta do my homework. So that’s scenario number one. I up my offer, and everybody’s happy. Scenario number two is, I still don’t agree. We talk about it, I explain why I valued it at that. I stand firm with my offer, and I leave the door open. So in any of these scenarios you really have to do your due diligence. Check it out on Google Earth, and run through your like engineering checklist is what I call it. And that all starts with getting the APN and then reviewing it on Google Earth and saying … And then you’re going to say to yourself, Jill, one of these three outcomes, right? Yes, so I agree we up it. We meet somewhere in the middle or whatever. I don’t agree, and I’ve had this all the time. I was like you know what, we’ve gone back and forth with people. And I’ve said, “Gosh, I appreciate it, this is my highest and best offer.” I’ve said that and, you know, “Hey, take your time, sleep on it. The door’s open, a week from now you change your mind, call me back and we’ll talk about it.” That happens, and that’s okay because there’s no way. Usually it’s like, I’m at two and they’re at ten or fifteen. I’m not going to two to fifteen kind of thing. You mean two thousand to fifteen thousand. [inaudible 00:09:10] They have no … They’re like, “Well it has to be, because my brother sold a property in Orange County, California for this money.” Well, because it’s Orange County, California. You’re talking about West Texas. You know, you have to kind of help them, if you will, they don’t know. So that’s that, and then the third scenario is … Back to second scenario is, they might come back. They often do come back so make sure you leave on good terms and leave the door open. You can even say, “This is all I’ve got in my acquisitions funds right now. I’ve got $2000 left to spend this month. I’m happy to give it to you, but that’s all I’ve got,” kind of thing and that’s it. Then the third scenario is, it’s still he’s at eight I came up to six, he still won’t come down from eight. I could maybe find some comps that show, maybe as a wholesale deal I could sell it for ten or twelve, all right. So now what I’m going to do is – I’m not out any money the way – because I wasn’t really happy with the eight. But let’s test it. So I’m going to go out. He signed a quick little one-page thing, sends it back to me so we’re all the same page that I get 90 days to work on this and try to go sell it. So now I’m going to put it out there for twelve thousand dollars or thirteen thousand dollars, whatever I think, all over the place and see what happens. Maybe he was right, maybe I get … So then I get someone comes back to me they want to buy it at eleven ninety-nine, we agree on that. Okay, so I take the eleven ninety-nine, I give him his eight and I get the money in the middle. I’m good with that too. 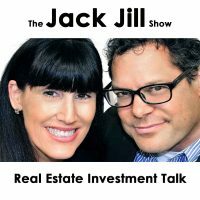 What Jill just described is the original and long-lasting model for zero-down real estate. It’s been.. That phrase has gotten so overused and so bogus all over the internet and on late-night TV. But what she described, we still do it all the time. It’s completely legit and everybody wins. It just doesn’t happen overnight and you’re probably not going to end up owning a yacht doing this. That’s the truth of zero-down real estate. It’s very possible, we do it all the time, it’s not that hard. For very detailed information on it, you can go to LandAcademy and search that topic through he blogs, or better yet go to SuccessPlant and ask, get yourself a username it’s free, and ask our existing members if this optioning thing … What it’s all about, how it works. It’s pretty neat and Jill does a lot of option deals. You’re taking an acquisition that otherwise you would have said, “No, no way Mr. Oregon. We’re too far apart. Thanks very much, call me when you get real.” You never want to do that, you don’t want an acquisition to go to waste. You want to make it work even it takes six or eight months. Jill that’s well said, that’s exactly how I would do that too. You know what else too, let’s say 90 days pass and nothing’s happened. Now, I’m going to go back to Mr. Jones and say, “All right, I’m still happy to offer you six.” I came up to six or five or a thousand whatever I came up to. He might go, “Yeah okay, I waited 90 days now, still nothing’s happening. All right, I’ll take it.” That might happen. Even if they’re talking to other people, which they almost never are, they’re not going to [liker 00:13:20] it. You have to get these people to like you. Do you want to know another Jill secret? Yes, yes. That’s why we have the podcast absolutely. I learn stuff from this podcast, by the way. Thank you. There is a secret, see if you can uncover why they want that money. There’s often an underlying story. For example, I had a woman who had a very ill pet that had a vet bill hanging over her head for a thousand dollars. When I finally uncovered what this money was for and why she was motivated to sell the property. You can uncover what’s going on a little bit. That might help you with the negotiation and figuring it out. There might be something behind why he’s asking x.
That’s the takeaway. Find out why they want to sell it. Find out what the trigger is. What the uses of the cash are. I think that covers the topic Jill, don’t you? I think so. I think we did great. Well in that case, join us in the next episode, or in another episode where Jill and I discuss your all-important success in property investment and that would be in session three of eight and in life.